As the result of a Saturday study session, Danville City Council members have new options on the table as they consider ways to fund their new budget. 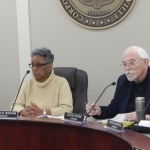 Alderman Steve Foster suggested dipping into sanitary sewer and solid waste reserves to pay part of the salaries for workers in other departments…. But Alderman Rick Strebing cautioned about raiding the more than $4-million dollars that is now sitting in Enterprise Funds for sewers and solid waste…. Council members also recommended cutting the number of code enforcement officers from 4 to 3 and eliminating a position in the Public Affair Department. It is the position that some downtown businesses asked the city to keep at a meeting last week. Amanda Vickery holds the position and has been the person behind the recent First Friday events in downtown Danville. Mayor Rickey Williams was asked what happens now with the proposals to raise the hotel-motel tax by 2-percent and place a $200 annual fee on video poker machines…. Alderman Steve Nichols likes Foster’s proposal…. Since Saturday was only a study session no official votes were taken…but Williams asked council members to raise their hands to get a consensus of their opinions. Also yet to be decided is whether the council will raise the fee for large solid waste set-outs. All of the items are expected to be addressed at the council’s April 2nd meeting which begins at 6:00 p.m. at the Robert E. Jones Municipal Building.